Have you ever eaten roadkill? I know several people that have, but it’s not something that appeals to me. Besides the yuck factor, there’s the risk of disease. So why would you tolerate Roadkill Marketing in your organization? 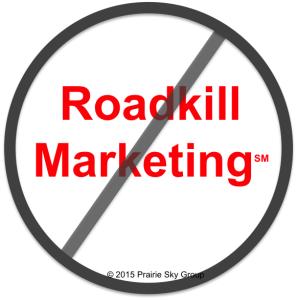 What’s Roadkill Marketing? Just like it sounds. It’s driving in any direction toward a distant business goal, picking up whatever leads, prospects, or customers you happen across on the side of the road, and trying to build a growth path on the energy they provide. There’s lot’s of good marketing going on out there, but Roadkill is particularly unconscious and insidious. Its main symptom is focus on marketing tactics ahead of marketing strategy. I’m a great believer in execution, but execution without direction is a waste of effort. Let me give you an example. At a sales meeting I heard a marketing person ask a B2B sales team what they thought they needed. They dutifully gave the list of usual suspects: 1) a lower price, 2) more literature, 3) a prettier website, and 4) some advertising. When asked about the advertising, one sales person suggested a billboard. I found this last suggestion particularly interesting and my Roadkill radar clicked on. Since this was a B2B company, I asked on which highway would they place the billboard? Who did they want to message, and what message did they want to convey? And could the get the message succinct enough to be read at 50 mph and 50 yards away? The biggest barrier to good marketing are not the tactics or communication channels. It’s identifying your market segments, the prospects, and understanding their business needs, developing a go-to-market strategy, creating a value proposition, positioning, and messaging. Then it’s experimenting in attracting attention, building a connection, creating a compelling reason to take the next step, and getting someone to actually take that step. These things take a little time. But because everyone loves action, tactics take precedence. Marketers get to show they are producing literature, making the website prettier, and doing a billboard. Activities that are pretty much useless. Never mind that they don’t often complete many of these tactics, because they are rushing from one tactic to another without measuring what’s working. They are driving endlessly, hoping to pick up some roadkill. OK, perhaps this is a little harsh. But action is easier than thoughtful planning and asking tough questions. But action doesn’t necessarily give you results unless you learn from it and adapt to what you’ve learned. Marketers please take the following pledge… and let a little rage out in your comments. 1. My tactics will be based on sound strategy and planning. 2. I will seek to understand my customers/prospects, as well as their businesses. 3. I will support sales and be a team player. 6. I will be agile. Experiment, learn, and adapt. 7. I will complete one thing well on time rather than 10 things next month. 8. I will not create boring marketing. 9. I will constantly strive to improve our data and analytics. 10. I will measure the results of my programs and prove the ROI. What did I miss? Take the pledge here.